Ample Hills Creamery's royal wedding-themed ice cream flavor, God Save the Cream. Back in March, Prince Harry and his fiancee Meghan Markle announced they'd be having a lemon elderflower cake decorated with buttercream and fresh flowers for their May 19 nuptials. But guests of the exclusive wedding aren't the only ones who'll get to enjoy it. 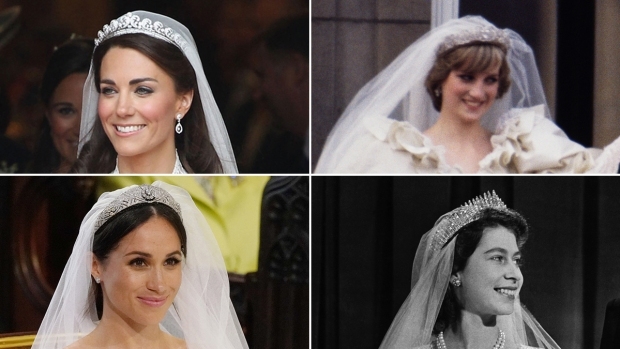 American sweet shops like Magnolia Bakery, Georgetown Cupcakes and Ample Hills Creamery are getting into the flavor of the royal wedding with their own twists on the cake. Next weekend at Magnolia locations in New York City, Boston, Los Angeles and Chicago, customers can pick up a special royal wedding-inspired cake and cupcake. One hotel is offering a “propose like a prince” package, including a horse-drawn carriage ride. The elderflower cake and cupcake available May 16-19 will be filled with lemon curd and topped with an elderflower meringue buttercream, according to spokesperson Sara Gramling. The cupcake will be finished with a lace wrapper and crown and the cake will be finished with pearl borders and a fleur-di-lis design. And Magnolia is going beyond the oven, teaming up with Black Tap restaurants in New York City and Las Vegas, known for their elaborate milkshakes, for a royal creation: "a vanilla shake with a vanilla frosted rim with white sparkling sanding sugar, topped with a two-tiered lemon elderflower mini wedding cake from Magnolia Bakery," Gramling said in an email. Georgetown Cupcake, known for its TV show on TLC, has been whipping up lemon elderflower cupcakes along with a special set of a dozen cupcakes since the start of May. The lemon elderflower cupcake features a citrus and floral flavor, frosted into the shape of an English rose with elderflower-infused vanilla buttercream. “Our Lemon Elderflower cupcake was created to celebrate the Royal Wedding and we are offering it on our menu all month long. It has been an extremely popular flavor among our customers – it’s bright floral and citrus notes and flower petal frosting make it the perfect Spring cupcake flavor,” said owners Sophie LaMontagne & Katherine Berman in an email. The royal wedding dozen includes two of the lemon elderflower cupcakes and two red velvet cupcakes decorated with white pearlized wedding sprinkles and fondant UK flags. It also has valrhona chocolate and madagascar vanilla buttercream cupcakes decorarted in a variety of ways: “H&M” monogram fondant for Harry and Meghan, “Happy Ever After” fondant, “May 19, 2018” fondant and white wedding sprinkles and white fondant flowers. A London printer was assigned the task of printing invitations for the royal wedding of Prince Harry and his fiancee, Meghan Markle. Georgetown Cupcake has locations in Washington, D.C., New York City, Boston, Los Angeles and Atlanta, and ships online as well. Getting a little more patriotic, Ample Hills Creamery in New York City is bringing in a customer-designed "God Save the Cream" flavor, a lemon ginger ice cream with pieces of elderflower butter cake and buttercream frosting tossed in. The flavor will be available in the creamery’s Manhattan, Jersey City and Brooklyn locations on Monday, May 14, but is also currently being sold online in a four-pack that also includes a pint of Strawberries & Cream, rumored to be Markle's favorite, and a paper crown. 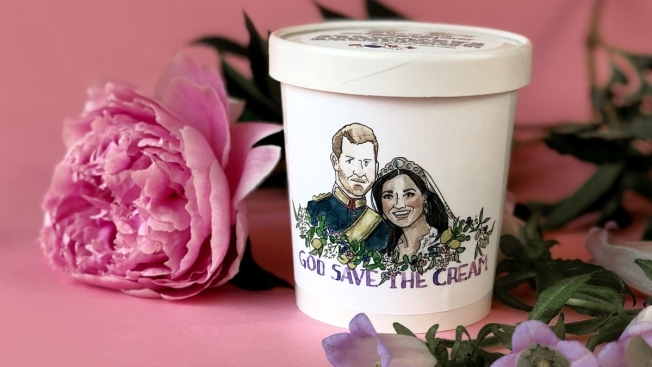 Pints of "God Save the Cream" are packaged with a colorful illustration of Harry and Meghan. Back on March 20 Kensington Palace brought the news to Twitter of who would be baking the cake — Claire Ptak of London's Violet Bakery — and the flavor chosen by the soon-to-be Duke and Duchess. Prince Harry and Ms. Markle have asked Claire to create a lemon elderflower cake that will incorporate the bright flavours of spring. It will be covered with buttercream and decorated with fresh flowers. Dunkin Donuts has also launched a royal wedding-inspired doughnut, but the heart-shaped creation isn't lemon elderberry-flavored but jelly-filled with chocolate frosting and strawberry drizzle. That's available May 14-20. "We hope all donut lovers, royalty or not, will enjoy the new Royal Love Donut next week," said Dunkin' Brands Chairman and CEO Nigel Travis, a dual-U.S. and British citizen, in a statement.